What Toxins are Hiding in Your Family’s Bathroom? A risk level of 3 may seem acceptable for toothpaste, but when I scanned our adult toothpaste and found it was only a 1, Earth’s Best no longer seemed like the best option for E, (and, for the record, the new formulation receives the same score). I have to start this post with a disclaimer. Life is full of too many hazards to obsess about every single product we use. However, I believe it is better to know what we are putting in and on our bodies than to blindly follow the labeling at the grocery store. After all, when a tube of toothpaste is marked as safe to swallow for toddlers, it better actually be safe! Last night, as I was attempting to keep my eyes open through E’s current sleep regression, (yay for the nightly need to practice standing from 10PM to midnight…), I scrolled past an interesting app on Facebook. While I often wonder whether the products I buy for our family are safe, I usually rely on my own knowledge of ingredients instead of taking the time to research all the ones I know nothing about, (most of them). 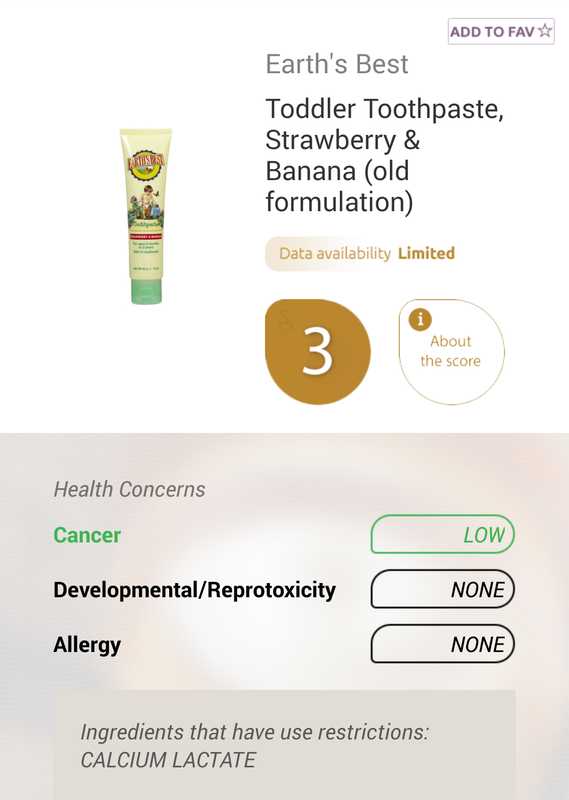 Thankfully, the Skin Deep app provides a decent solution. From your smart phone, you can either scan the barcode of the products you use or type in the name of the product if the barcode is not stored in the system. Amazingly, I was able to pull up information on all but one item in our bathroom. The downside, I now have to make sense of what I discovered and decide which products get to stay and which will no longer be on our shopping list. 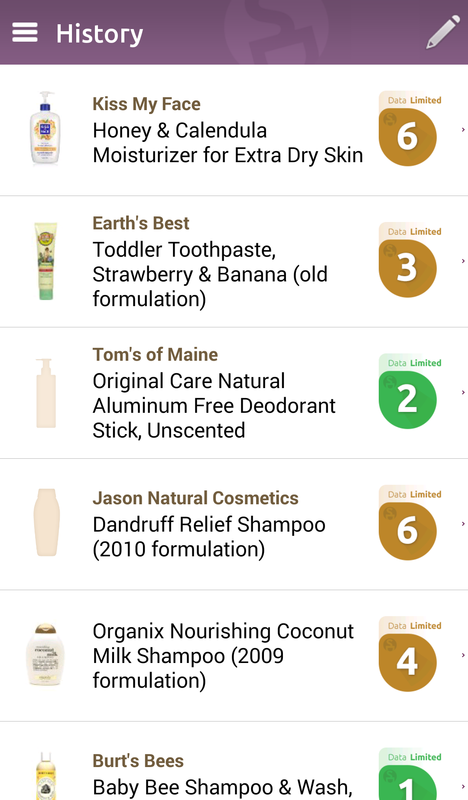 Surprising to find that some “natural” brands are really not as natural as they claim, (okay, maybe not that surprising). Still, cool to discover which brands hold true, (way to go Tom’s). Earth Mama, which is not pictured here, also scored 0’s across the board. This is helpful. Thanks for sharing the app! Love skindeep! So happy they have an app now since I’m always googling their ratings on my phone in the drug store aisles! Keep spreading the word :D.
Yay, thank you for helping me stay true to more natural products… The encouragement helps fight the temptations, hehe. Thank you for my laugh out loud moment of the day …”yay for the nightly need to practice standing from 10PM to midnight…” That right there is priceless. Haha, looking forward to when it becomes a funny memory for me 😉 For now, exhausting! But, pretty cute, too. Last night she was ready for bed at midnight after she had successfully stood and said dog while looking at Simon… Good stuff. Priceless. Those are tough moments, but they are also the moments I refer to as making it all worth it.